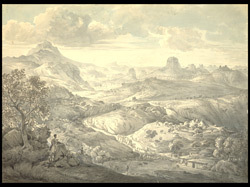 Wash drawing of a mountainous landscape near the village of Asceriah in Ethiopia in Africa, dated 15th August 1805. This is the original drawing for 'View near the Village of Asceriah, in Abyssinia', plate 17, of Henry Salt's 'Twenty Four Views in St. Helena, the Cape, India, Ceylon, the Red Sea, Abyssinia and Egypt'. Viscount Valentia (George Annesley) wrote, "August 15.-...we made our way through a grove of wild olive trees, and afterwards along the edge of a tremendous precipice, looking directly down into a gulley, in which were small pools of water, but no running stream. We then descended, and passed along the bed of the torrent for some distance; a shower of rain overtook us, but it was over before we had ascended the hill on which stands the village of Asceriah...I took here a view of the mountains which are extremely wild in their forms; and a sketch of the Abou Gumba, of which Bruce has given a very correct representation."